Happy New Year! I hope everyone had a wonderful holiday season! Evan and I traveled to Minnesota for Christmas and spent a week relaxing with my family, eating way too much good food and drinking a few too many Bent Paddle black ales. Despite the -20°F temperatures, it was a great trip. We traveled back to Seattle for New Year’s Eve to celebrate with some friends and catch the fireworks from the Space Needle. As we enter into the new year, I always enjoy hearing about people’s resolutions. One of my friends always comes up with great challenges for the year and I’m impressed by how she follows through on them. Personally, I’ve never really been into making resolutions, but this year I decided to focus on one goal for the year – to work less and spend more time doing things I really enjoy. Last year feels like a blur to me because I got so caught up in work, not allowing much time for myself. I rarely had time to see friends, make dinner, exercise, and as you probably noticed, work on this website. However, I started a new job the first week in January, and I’m already seeing a major improvement in my schedule. I’m so excited about the change! 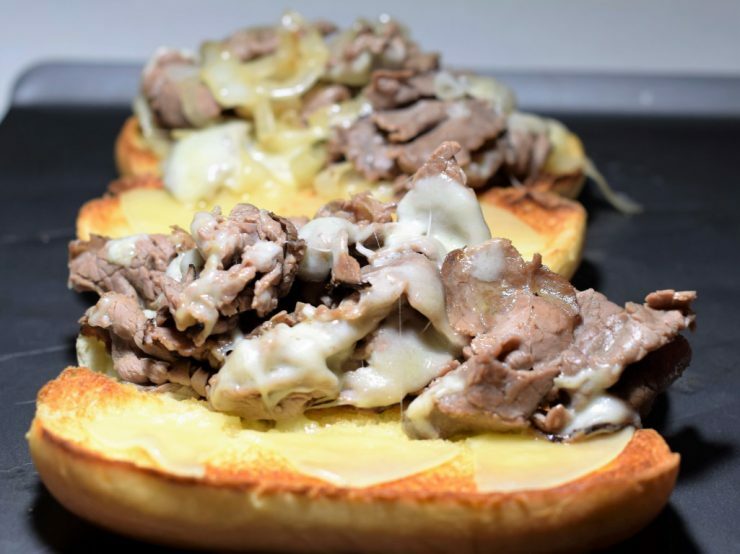 Despite my lack of time to make dinner most nights last year, Philly cheese steaks frequently made an appearance on my somewhat existent meal plan. Even if I was at the office late, I could still squeeze in the prep for this meal when I got home. It’s a great weeknight meal because these sandwiches are incredibly easy to make and dinner can be on the table within 20 minutes. To make the sandwiches, start by cooking the vegetables. 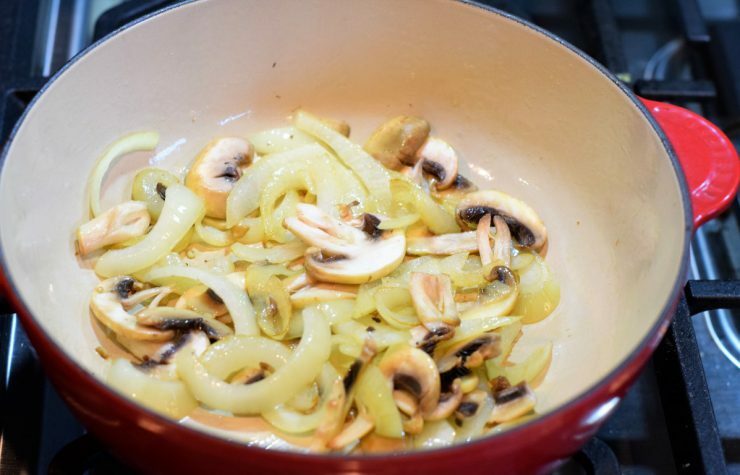 I like to use onions, mushrooms, and green peppers (if I have them on hand). Evan prefers his without vegetables, so I just cook up enough for me. Heat one tablespoon of olive oil over medium high heat in a deep skillet, such as a Le Creuset saucier pan. Add the sliced vegetables to the pan and saute until translucent. While the vegetables are cooking, preheat the broiler. Place sliced hoagie buns on a cookie sheet and lightly spread some butter on each half of the bun. Once the oven is ready, broil the buns for several minutes, until they are lightly toasted. 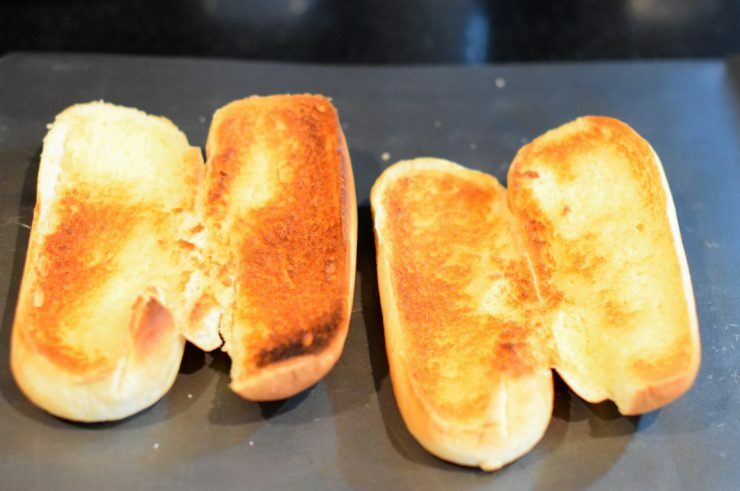 Keep a close eye on them; they toast quickly and you don’t want them to burn. Turn off the broiler, move the cookie sheet to a lower rack in the oven, and keep warm until the meat and vegetables are ready. Once the vegetables are soft, add the sliced roast beef to the pan. The deli meat will cook up fast – in just about 2 to 3 minutes. You’ll notice the roast beef will turn a lightly darker brown when it’s ready. 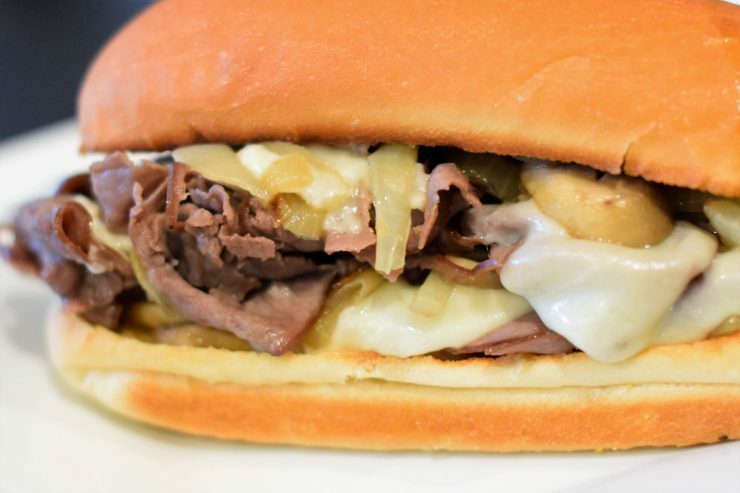 When the roast beef is cooked, place the sliced provolone on top of the meat, making sure it’s all covered. Turn off the heat, cover the pan, and let sit for two to three minutes, until the cheese is fully melted. Once the cheese is melted, carefully divide the meat, cheese, and vegetables between the hoagie buns. I add an extra slice of provolone cheese to each bun because you can never have enough cheese. Once the buns are fully loaded with meat and cheese, fold the top half of the bun over to close the sandwich, then serve and enjoy immediately. Don’t forget the napkins; these tend to be a little messy – but I promise, they’re worth it! 1 pkg sliced roast beef, about 8 oz. In a deep skillet or saucier pan, heat olive oil over medium high heat. Add in onions and mushrooms and saute until translucent. While vegetables are cooking, preheat the broiler. Place hoagie buns on a cookie sheet, apply a light coating of butter to each inside face. Broil the buns until they are lightly toasted. Keep warm. 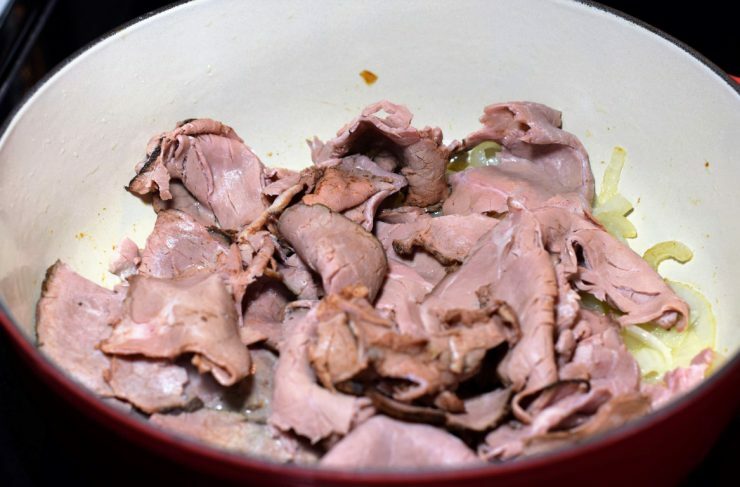 Once the vegetables are cooked, add in the sliced roast beef and cook about 2 to 3 minutes, until it turns a darker brown and is cooked through. 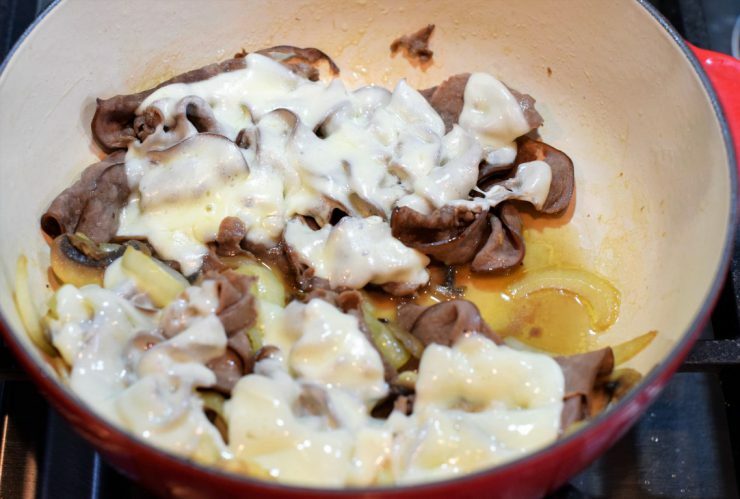 Cover the meat with 2 slices of provolone cheese (or more if needed). Turn off the heat, add the lid to the pan, and let sit for 2 to 3 minutes, until the cheese is fully melted. 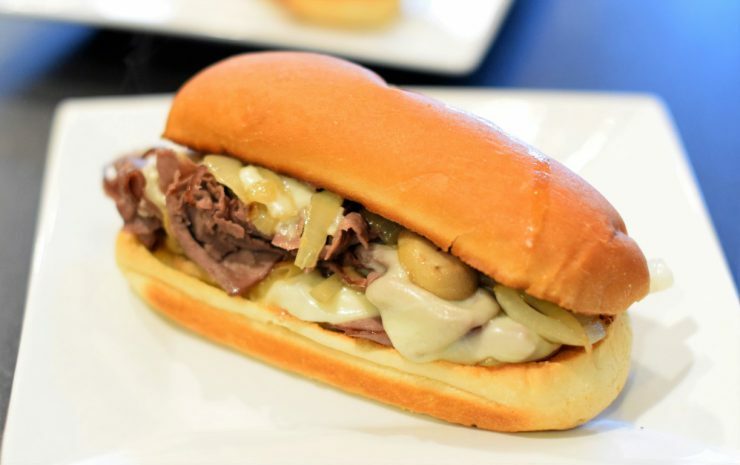 Divide the meat and cheese mixture equally between the hoagie buns. Add one extra slice of provolone cheese to each sandwich; I tend to break it in half and add directly to the bun so it heats up and starts to melt. Fold the top half of the bun over to close the sandwich. Never miss a delicious recipe by subscribing to Decanteria!